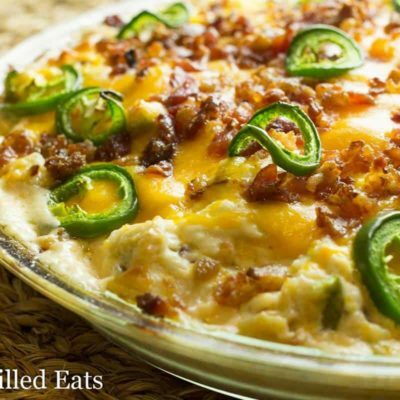 My Jalapeno Popper Dip Recipe is perfect for entertaining or when you just want finger food for dinner. 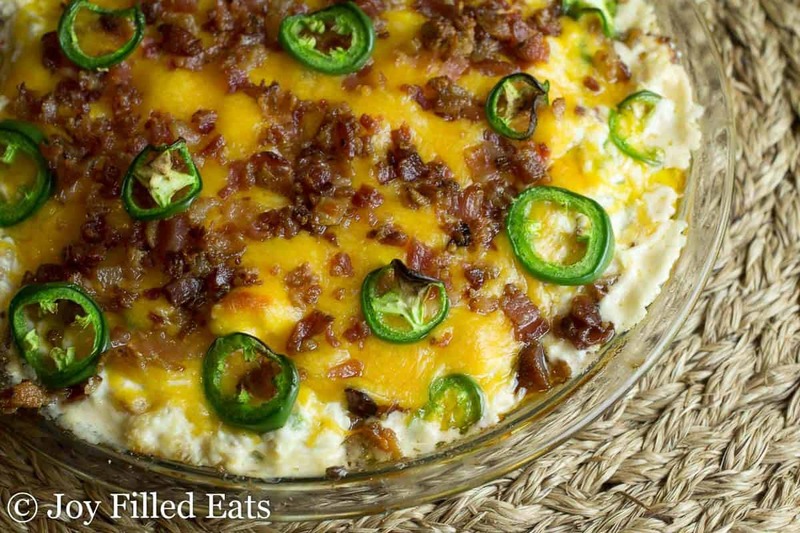 It is creamy, cheesy, loaded with bacon, and has as much of a kick as you want. When the Giants are playing my husband sets everything else aside and plops on the couch for the 3-4 hours a football game takes. He works very hard so I’m ok with giving him this time to relax each week. When a game falls over dinner we eat appetizers and lounge in front of the tv. It’s fun for the kids and changes it up since we sit in the dining room as a family for dinner almost every night. 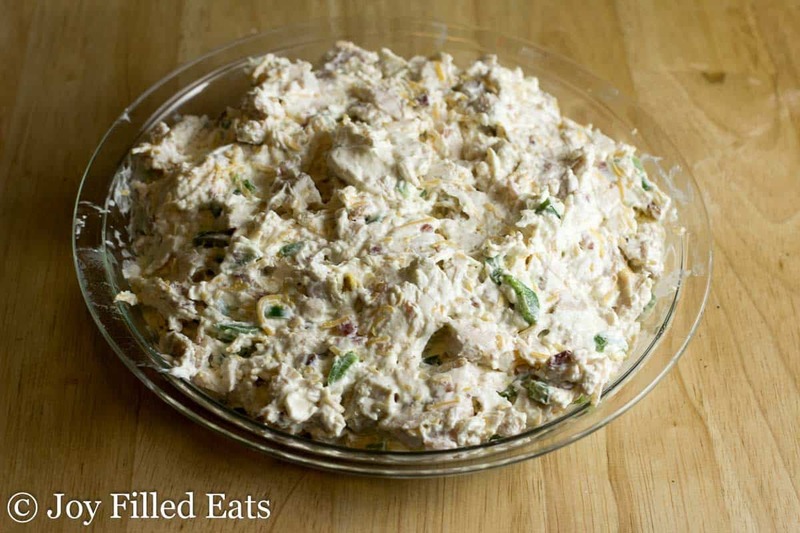 I made this jalapeno popper dip recipe with chicken because I had leftover cooked chicken but I think it would be excellent with steamed cauliflower too. Cauliflower has a mild enough flavor that it would work well with the other ingredients. I’m a bit of a wimp when it comes to spicy food. I used 1/4 cup chopped jalapeno and it had a slight kick. I think I’m going to brave 1/2 cup next time. 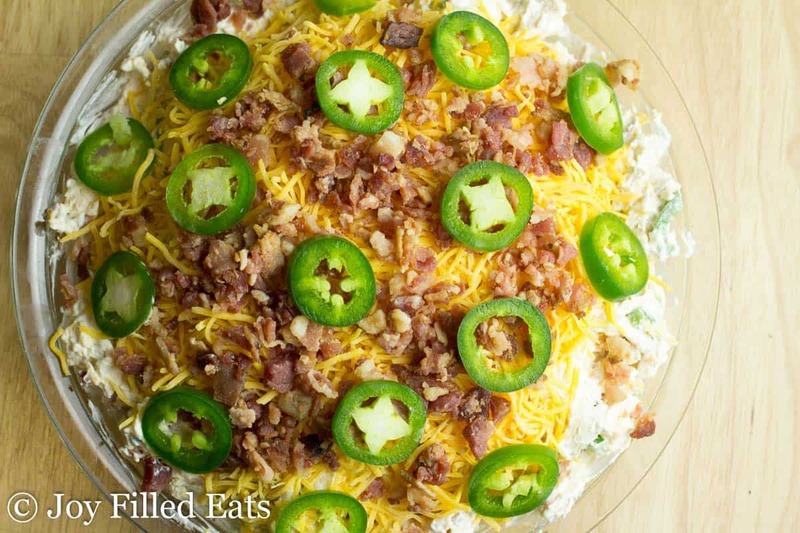 If you enjoy eating spicy food you can use a full cup and keep the seeds in for my jalapeno popper dip recipe. I made sure to remove each and every seed. And I still didn’t even try the jalapenos on top. Told ya I was a wimp. Last time my husband and I got Indian takeout for date night I could barely eat it. My mouth was on fire after the first bite. Next time I will remember to ask for mild everything. 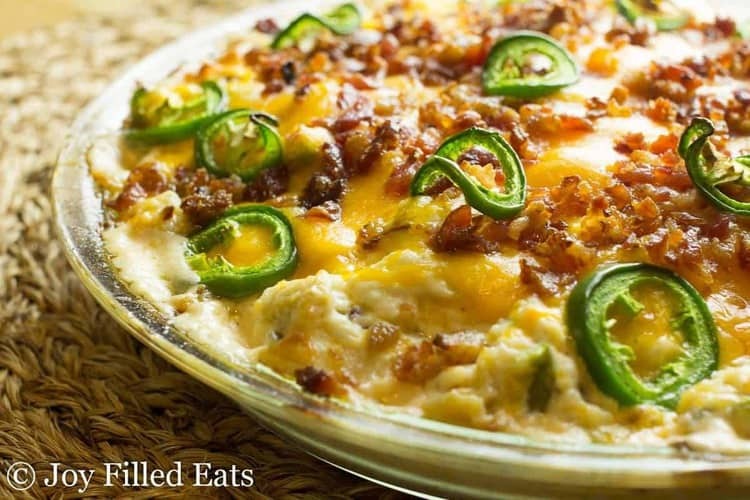 Jalapeno Popper Dip is perfect for entertaining or when you just want finger food for dinner. 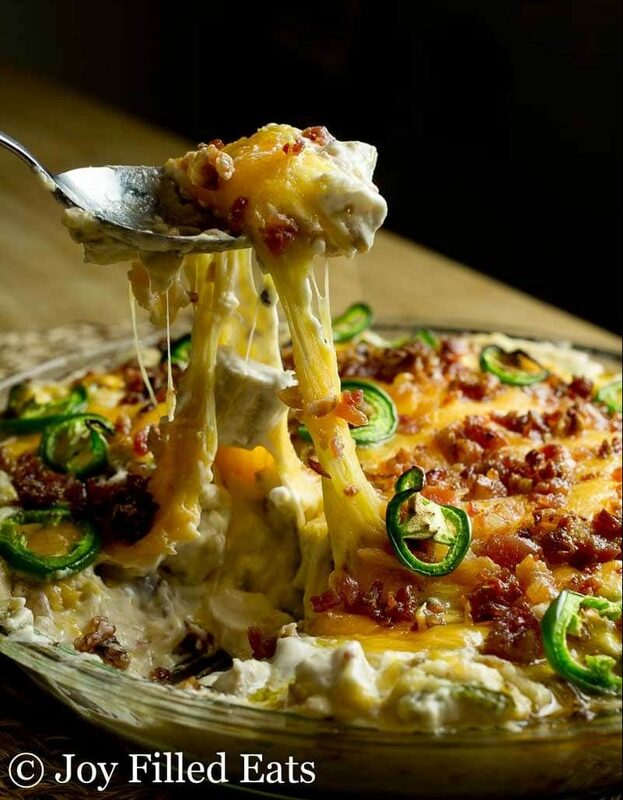 It is creamy, cheesy, loaded with bacon, and has as much of a kick as you want. Combine the dip ingredients and spread in a pie plate. Top with the remaining topping ingredients. Bake for 30-40 minutes until hot and bubbly. *** I'm a bit of a wimp when it comes to spicy food. I used 1/4 cup chopped jalapeno and it had a slight kick. I think I'm going to brave 1/2 cup next time. If you enjoy spicy food you can use a full cup and keep the seeds in. Nutritional facts don't include serving size...... I'm on a low-card diet and have to count those suckers! A serving is 1/8th of the recipe. I normally just eye it up and scoop it onto my plate. There is a gray bar on the top, side, or bottom depending on how you are viewing. This would be great with pork rinds as well! The heat of a jalapeño is in the seeds and the membrane so if you remove all of that, the pepper is actually mild. Using a pickled jalapeño is often less spicy as well. I still find jalapenos spicy without the seeds and membrane. But I'm a bit of a baby with spicy food ;) I've never had pickled jalapenos. I'll have to give them a try. If you use the fresh green chilis (they look like larger jalapenos) they are very mild with all the flavor of a jalapeno. That's what I use. What do you use to dip into the dip? Or do you just eat the dip with a fork?